Note: Every word on this page is it's own help button. Click on words to experience a new technology for supporting readers (and keep clicking until the box turns green). LEARNING MORE ABOUT LEARNING IS ESSENTIAL FOR ANY INDIVIDUAL AND ANY ORGANIZATION - ESPECIALLY SCHOOLS. Within this decade companies interested in determining which among numerous candidates is best for a position, will send their candidates to LCAS - Learning Capability Assessment Services. At LCAS, candidates will be placed in simulated informational, interpersonal and collaborative situations that have been designed to exercise the edge of their current 'know-how'. The main point of these simulations will not be to assess knowledge, but rather, to observe the candidate in situations that require learning. Once roughly qualified on know-how, the determining consideration for candidate recommendation will be LCAS' assessment of how well each candidate can on-goingly learn. Sound frightening? Its just evolution in fast-forward. Only continuously learning organizations can sustain and extend their existence in a highly competitive global economy. Such organizations need learners, indeed are a community of learners. Organizational evolution will 'select' learners and whereas the distinguishing attribute of a "knower" was "know-how", the distinguishing attribute of a learner is "learning-now". It's already becoming the business of business to be able to recognize the difference. What's frightening to me is that business will be developing this selectivity almost a generation ahead of people being educated well enough to thrive in it. 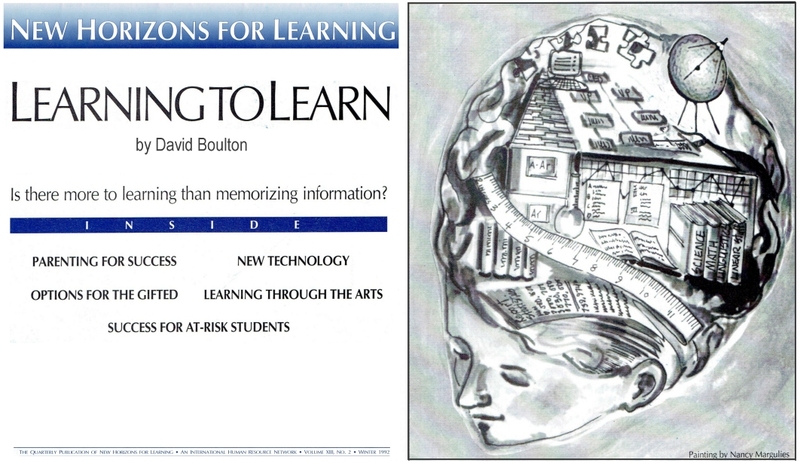 How can we learn about learning to learn? What does `learning to learn' mean? as the primary compass from which to participate? Obviously, the deeper meaning here is associated with learners learning to extend and master their own capacities for learning. But how can we help them do it? What are our least subject specific, most generally applicable, capacities for learning? How do we help learners apply and extend them? Before we can extend our capacities for learning we must first make our experience of learning more vividly conscious. It's hard to develop something we aren't aware of. In learning to walk, we learn to integrate a great number of bodily impulses into a sense of balance. After repeated falls we develop a `sense' of beginning to `fall' that informs the movements that sustain our balance. Similarly, if we can develop a `sense' of `falling' out of learning - if we can learn to sense ourselves `dropping out' or `disengaging' - it can illuminate and extend our capacity to participate in learning. What could be more generally useful to a learner? How might we become aware of falling out or dropping out of learning? Sometimes we fall out because we are disinterested, tired or distracted by other things going on around us. But there is another class of falling out that results from having encounters with events (physical sensations, words, terms, phrases, concepts, ideas, sounds, languages, pictures, presentation styles, frames of reference, etc) that `miss' or simply do not make meaningful connections. Such `misses' cause spikes of uncertainty, curiosity and creativity (my son calls them `need mores' and `want to adds'), I call them meaning needs. Implicit in our experience of confusion, uncertainty, or curiosity is the need for meaning. By "meaning needs" I refer to the impulses that underlie, give direction to and emerge within conscious awareness and activity. I believe they are the core of a student's capacities to employ "critical thinking skills", to formulate a "good question", to "construct knowledge", to "abstract coherently", to avoid "premature closure", to avoid "tendencies toward self-deception", to live with "ambiguity" and to dis/cover his or her own "creativity". After all, what is an authentic question but the articulation of living uncertainty? On what basis does one learn to distinguish between authentic creativity and distracting tangents? As these impulses fluctuate in various contexts, how the learner has been habituated to, or has learned to participatively respond to them, (consciously and/or subconsciously follow through with or suppress them) is, I believe, close to the phenomenological core of his or her capacities for learning. Differentiating these impulses into integrated physical behaviors is the way we learn to walk, ride a bike or dance. In more subtle ways we tune into these impulses when learning to hear the the difference between alphabet sounds. But whereas this internal process of learning to learn serves us so well in the real world of physical-sensory activity, this awesome process is largely ignored when we enter the world of knowledge and formal education. Our meaning needs arise from the deepest and most authentic activity of our learning process - when we learn to ignore them, no matter what else we may be learning `about', we cut ourselves off from the fountainhead of our capacities for learning. Developing a new sense of learning begins with vivifying our awareness of our meaning needs. I suspect, based on my own early experience as well as watching children today, that most of us learn to ignore all but our most powerful meaning need impulses. We learn to suppress following through with them not because we have discerned that they are meaningfully inappropriate, but because we have learned that they are for the most part circumstantially irrelevant or inapplicable - like waving our arms in front of a blind person. I submit that our educational systems, in the name of helping us learn about things, is creating an environment in which we learn to separate from, suppress and tacitly invalidate the deeper intrinsic movements that are our most important capacities for learning. I think our educational systems are unintentionally yet pervasively facilitating our learning not to learn. We only learn to extend our capacities in environments that support and feedback to us - allow us to sense ourselves - on the very `edge' of our experiencing. If we want to help people learn to extend their capacities for learning we must meet them on the `edge' of their learning. To do this, we must first be able to respond to their meaning needs. • How can learners learn to extend their capacities for learning without first learning to trust their own `meaning needs' as the primary compass from which to orient their participation? • How can learners learn to trust their own `meaning needs' without a learning environment which is responsive enough for them to experience those needs in the first place? • How can environments become capable of responding to learners at the level of their `meaning needs', unless the educator's goal in designing them is that they become the `scopes' or `two way mirrors' through which the educators themselves learn what they are and how to respond to them? • How do we reconcile the need to respond to learners at this level of meaning with the need to achieve curriculum objectives. I think that the way we approach these questions is crucial. Historically, having been concerned with producing `knowers', we have valued their 'know-how' as the `end' and, secondarily, their capacities for learning as the `means'. But today, our challenge is to facilitate learners. As learners must, almost by definition, be capable of learning in ways and about things that can't be reliably predicted at the time of their education, we must invert our orientation: knowledge, skills, and other tools must become the `means' - the environment - we provide learners to exercise and extend their capacities for learning in. From this orientation, everything we `learn about' is is but part of the contextual gymnasium, the apparatus, in which we exercise our capacities for learning. All of this leads me to the core of my work. Having seen the necessity and inevitability of a radically new educational paradigm, I am one of a team of learners dedicated to making it happen. After nearly a decade of research, we are developing a comprehensive social and technological system through which each learner's personal "meaning needs" and the impersonal learning objectives of the educational system can be "mediated" in a way that allows each to continually learn from the other. We call our system "DIACOM" as it is based on the social and technical processes of dialogue, collaboration, performance support, communications and computers. In essence, it will provide each learner an "interface" that will enable them to become more conscious of and able to apply their own learning and meaning needs to achieving mastery over educational objectives. These interfaces, again both technical and social, will connect with one another in a way that enables collaboration between learners and that will inform teachers (through "teacher interfaces") of the needs of each individual and of the needs of the class as a whole. Finally, utilizing the emerging sciences of the "learning organization", the information flowing out of these interfaces will provide educators and curriculum designers with the feedback they need to evolve learning oriented curricula. Our most basic learning capacities depend on extending our awareness through real time feedback and feed-forward relationships with our environments. Without gravity and the solidness of the ground we couldn't learn to walk - we couldn't learn to walk in space. Without the water's support and resistance we couldn't learn to swim - we wouldn't learn to swim in a desert or on a mountain top. Learning to walk and swim in the "meaning space" of knowledge is no different - just subtler. Without an entirely different and more responsive relationship between what we learn and how we learn, we, individually and as a species, can't sustain (let alone extend) the learning oriented natures we are born with.